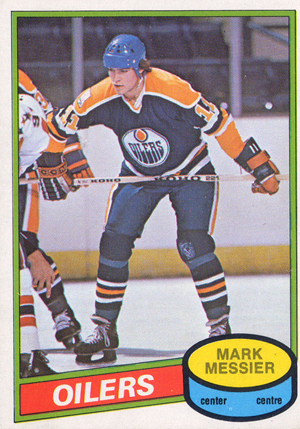 In 1980-81, Topps experimented with its hockey cards, placing a scratch-off area over the player's name on the front. With 1980-81 O-Pee-Chee Hockey, the design was retained. However, the Canadian card manufacturer opted not to make its into cards novelty items. 1980-81 O-Pee-Chee Hockey card fronts have a player photo that is sometimes posed, but is usually a game-action shot. A puck graphic is in the lower right corner. The top part contains the player's name, but has been covered with scratch-off material. The player's position appears on the edge of the puck. A banner extends at an angle from the puck and contains the team name. On the back, another puck icon in the upper left corner contains a card number, and a strip extending across the card gives the player's team and position, but not his name. A box of vital stats appears, followed by a main area with year-by-year statistics and short bullet points in English and French if needed. A cartoon about the player appears on the right side. There are 396 cards in a complete 1980-81 O-Pee-Chee Hockey set. All-Star players are given their own subset, which runs from cards 81 through 92. Even though the set was issued in Canada, players who were on the 1980 U.S. Olympic hockey team are given a shield designating their place in history. The first five cards in the 1980-81 O-Pee-Chee Hockey set feature highlights and record breakers, cards 161 through 168 shows the league leaders in several categories, and cards 262 to 264 recap the playoffs. There are three checklist cards in the set, and a change in team cards leaves a single player featured as a leader in some category. Unlike previous years, these are scattered throughout the set. Ray Bourque and Mark Messier are the most significant rookie in the set. But there is actually a much larger crop of first-year players than usual. Other notable 1980-81 O-Pee-Chee Hockey rookie cards include Mike Gartner, Dave Christian, Mike Foligno, Michel Goulet, Rod Langway, Mike Liut, Brad Marsh, Ken Nilsson, John Ogrodnick, Brian Popp, Mike Ramsey, Rob Ramage and Rick Valve. 1980-81 OPC O PEE CHEE # 87 Wayne Gretzky 2ND ALLSTAR EDMONTON OILERS NICE ! !